Vortex does a good job of importing my mods from mod organiser 2. Resolved various conflicts & ran loot to resort order. Ran SSedit which reportes no plugin errors. 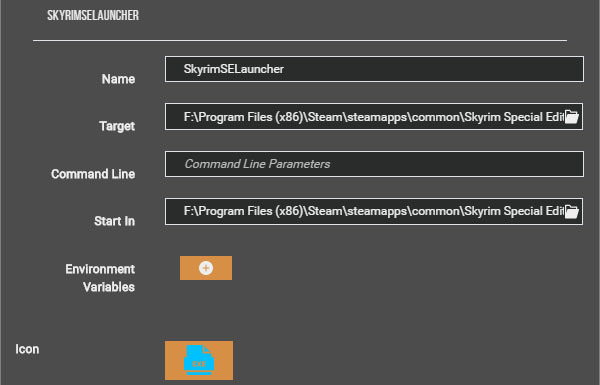 Howerver, I can't lauch the game with SKSE64 launcher. I've added a button in the dashboard for SKSE64 launcher but when I hit the run (arrow) icon & get a brief hourglass then a window asking for vortex to take control of the computer then it flips back to the vortex dashboard without starting the game. Using Vortex 0.15.2 - Help appreciated. Edited by pcaviator, 12 June 2018 - 12:34 PM. Can you show us what you configured for the SKSE dashboard button? Unfotunately, the important parts are not visible in your shot... Could you please just cut'n'paste the contents of "Target" and "Start in" and post them here? Edited by pcaviator, 14 June 2018 - 02:04 AM. Did you select the "Run as default" button? I set the skse64_launcher button as 'primary' & use the > 'run' button.